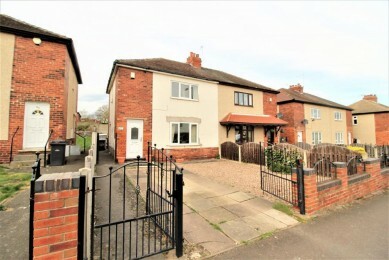 Gates estates are pleased to offer this well presented three bedroom semi-detached house located within a short drive of Barnsley Town Centre and having good local amenities on the doorstep including shops and schools. Accommodation comprises; entrance hall, lounge, dining kitchen, downstairs bathroom, and three first floor bedrooms. The property benefits from gas central heating, double glazing, good sized garden and gated driveway which can accommodate several vehicles. **VIEWING ADVISED**. A front facing upvc door opens into the hallway which has a radiator, access to the lounge and stairs rising to the first floor landing. Having a good range of modern wall and base units with roll-edge work surfaces which incorporates a stainless steel sink and drainer. Integrated appliances include electric oven, gas hob and extractor fan above. Plumbing and space is provided for an automatic washing machine plus a radiator and double glazed patio doors lead out to the garden. Having a three piece suite comprising; low flush wc, pedestal wash basin and bath with electric shower above. The room has tiling to the floor and full tiling to the walls with a radiator and obscure glazed windows. A side facing Upvc door opens into the side lobby which has access to the bathroom and dining kitchen. There is also a useful under-stairs store cupboard. Giving access to all three bedrooms and access to the loft. A spacious front facing bedroom which is neutrally appointed with double glazed window, radiator and fitted wardrobes. This second double bedroom has a front facing double glazed window, a radiator and useful store cupboard. A single bedroom with a radiator and front facing double glazed window. To the rear is a good sized garden which is mainly laid to lawn allowing an ideal place for children to play or for pets.